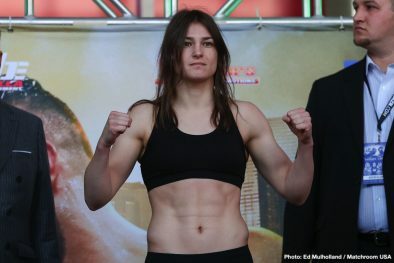 Katie Taylor believes that she can become the greatest female fighter ever as she meets Rose Volante in a World Lightweight unification clash at the Liacouras Center in Philadelphia, PA on tonight (March 15), live on DAZN in the US and on Sky Sports in the UK. The Irish favorite can take a step closer to her goal of becoming the undisputed champion on St. Patrick’s weekend, with a summer showdown with WBC ruler Delfine Persoon on the cards to enable Taylor to own all four belts at 135lbs – with promoter Eddie Hearn saying this week that that clash could take Taylor back to Madison Square Garden, New York on the undercard of Anthony Joshua’s World Heavyweight title showdown with Jarrell Miller on June 1. The 32 year old has targeted mega fights later in the year with seven-weight World ruler Amanda Serrano and undisputed Welterweight champion Cecilia Braekhus – the types of fights that could make Taylor go down in history as one of the true greats. “I want to be an undisputed champion, I want to make history in the sport, leave behind a legacy and be known as the best of all time for years and years to come,” said Taylor. “I wake up every day so blessed and grateful to be able to do something that I love, even on those days that I am not in the mood to train, and I do have those days, we all do. “The biggest challenge is to change people’s perception of the sport. There are still a lot of people that don’t agree with women’s boxing but I think that is definitely changing and people are seeing the best of women’s boxing right now. “I’m very lucky to have been given this platform to perform on these big stages and giving women’s boxing the showcase that it deserves. People hadn’t seen the best of the sport before but with Sky Sports and DAZN backing us, we’re on a high – it’s a golden era. “You are seeing the Olympians turning over to the pros now and that’s huge for the sport, the strength in depth really is there now, especially around Lightweight – there’s a stack of new stars in the sport and that’s why it’s great that there are big fights out there for me. “I would love to fight at MSG again, it was incredible to box there on the Canelo card, it was phenomenal. I just fight wherever I am told. 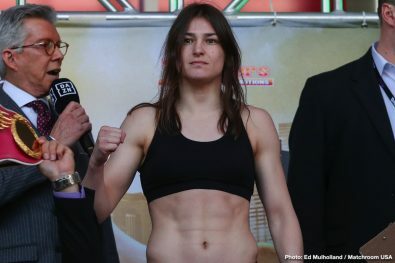 The Irish favorite can take a step closer to her goal of becoming the undisputed champion on St. Patrick’s weekend, with a summer showdown with WBC ruler Delfine Persoon on the cards to enable Taylor to own all four belts at 135lbs. A clash with seven-weight World champion Amanda Serrano later in the year appeals to the 32 year old, as does a meeting with long-time undisputed Welterweight champion Cecilia Braekhus – with Taylor plotting a sensational 2019. “This could be a monumental year for me, the biggest of my career both amateur and pro,” said Taylor. “I believe that by the end of the year I can look back at being the undisputed Lightweight champion and have had huge fights with Amanda and Cecilia. They want those fights as well, but I have to keep winning and everyone raises their game when they fight me. “When I sat down with Eddie Hearn a few years ago and talked about turning pro, the one thing we talked about was to fight 3/4 times a year and he’s never let me down, I’m fighting regularly and they are great fights too. I have the chance to win my third World title belt inside two years as a pro, and I’d love to have four fights again this year, but Rose is the only fight in front of me. “Rose is a great champion. She’s strong and has a big right hand, she’s undefeated too so she’s a proud fighter and she’s chasing the same prize as me. We want each other’s belts and unbeaten records, but I have had a great camp and I am full of confidence. I think I am getting better and i think it will show on the night. This could be a very physical fight and I am prepared for that. “I’m at 135 now and I make the weight very comfortably. I could move up to 140lbs but 147? That could be a stretch but maybe I could make it; but anything past that I am not big enough for – so Welterweight would be my maximum. I couldn’t go down from 135, I love food too much! Taylor’s clash with Volante is part of a massive night of action as local hero Tevin Farmer (28-4-1 6 KOs) defends his IBF World Super-Featherweight title against Ireland’s Jono Carroll (16-0-1 3 KOs). Philadelphia Middleweight warrior Gabriel Rosado (24-11-1 14 KOs) faces Poland’s Maciej Sulecki (27-1 11 KOs) for the WBO International title and a likely World title shot at Demetrius Andrade, Philly Lightweight’s Hank Lundy (29-7-1 14 KOs) and Avery Sparrow (9-1 3 KOs) battle for local pride, Olympic gold medal pair Luke Campbell MBE (19-2 15 KOs) and Daniyar Yeleussinov (5-0 3 KOs) and silver medalist John Joe Nevin (11-0 4 KOs) taste their first action of 2019, unbeaten Super-Middleweight D’Mitrius Ballard (19-0 12 KOs) faces Victor Fonseca (17-9-1 14 KOs) while exciting New Jersey amateur star Raymond Ford makes his pro debut. Previous boxing news: Spence Jr vs Garcia: Daring To Be Great!